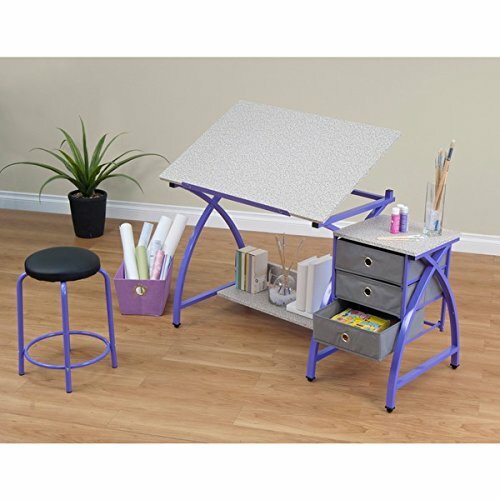 This three-piece drafting center provides a comfortable work space and keeps your supplies easily accessible. The set features three adjacent storage drawers, a padded stool and rich purple color so you can work in comfort and style. Sized to accommodate even large works, the adjustable table top tilts up to 20 degrees, so you can work comfortably even during long sessions. A long slide-up ledge keep pencils and pens at the ready, while the small foot bench is ideal for storing reference books or extra materials. Made from heavy gauge steel, the durable frame is built to withstand daily use and comes with a manufacturer's warranty for quality assurance.